William Arthur Blog: Thoughts On Writing | The L.W.A. Thoughts On Writing | The L.W.A. "Ink on paper is as beautiful to me as flowers on the mountains." As makers of fine stationery, we're especially fond of others who share our passion for the art of letter writing. 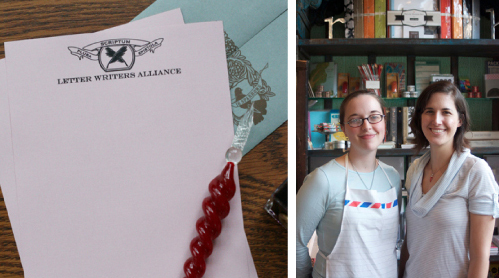 This week we're delighted to feature The Letter Writers Alliance, a Chicago, Illinois organization that promotes the art of letter writing through social gatherings and other events. "In this era of instantaneous communication, a handwritten letter is a rare and wondrous item. The Letter Writers Alliance is dedicated to preserving this art form; neither long lines, nor late deliveries, nor increasing postal rates will keep us from our mission." To that we say, "Write on, sisters." Inspired? Click here to view our stationery offerings and learn about receiving 25 pieces free.